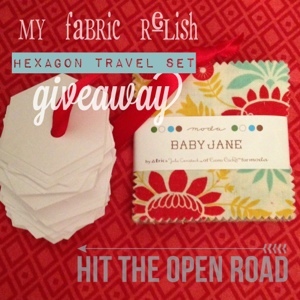 my fabric relish: Hexagon EPP and a surprise giveaway! I just tried English paper piecing (EPP is the lingo) and let me tell you....it's addicting and fun! If you like that sort of thing, of course. I thought I would jump on the bandwagon and give it a go before everyone and their dog (or cat or chicken) did it. Just last night, after I did a little EPP...yeah you know me (get it? little old school rap humor hehe), I caught up on some blogs and lo and behold...two blog post about the EPP hexagons! So, I decided I would add a little giveaway with my post. Keep reading to see! I used Bee in my Bonnet's tutorial series and pretty much did mine identical to hers. I used my silhouette to cut out my perfect 1" hexagons with a hole in the middle (makes it easier to get the paper out using tweezers or something...at least I think so). You can also grab a handy dandy printable template on Craftsy here. I also just grabbed one of my mini candy cakes from Moda to use (Baby Jane). At first I trimmed each piece of fabric with the 1/4 inch overage, but then realized this wasn't necessary and makes a mess that I have to clean up so I stopped that nonsense. 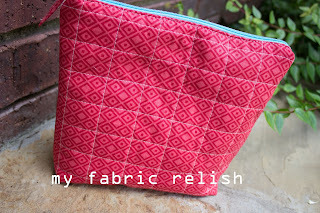 I knew I was going to make a zipper pouch to hold all my new EPP supplies...duh! 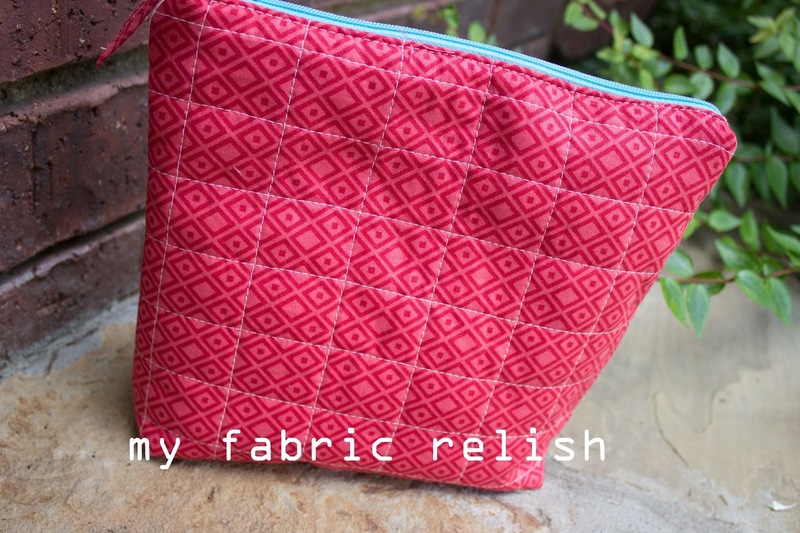 I just used this little tutorial to refresh myself on making zipper pouches....The Busy Bean's basic zipper pouch. I really wanted to use more of my flax seed linen but I was out!! Gasp!! And you want to know what came in the mail after I made the pouch? Yups...more flax seed linen. 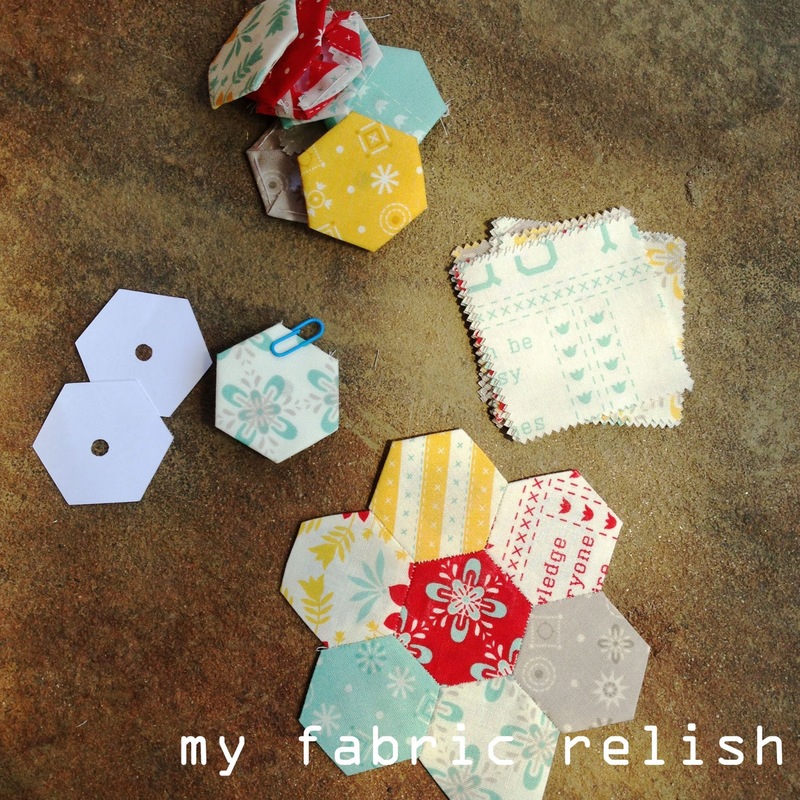 All you have to do is leave a comment letting me know what you plan to do with your hexagons! If you want to return the love, please feel free to follow me on Bloglovin! I will pick a winner Tuesday! Giveaway is now closed. You can find the lucky winner here. 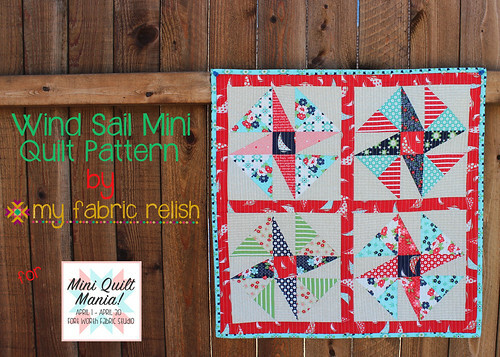 Linking up with all the great link parties to the right and Crazy Mom Quilts! Melissa.. thanks for the giveaway. And paper-piecing too! MY MIL is working on a gorgeous flower basket using the challenge fabric from our quilting group. I would LOVE a chance to try it out myself. Think I would work on a small piece to hang on the wall. Oh what a wonderful giveaway! I'm still new to all of this so I have not tried hexies yet but I really want to. I would of course start out with something small, either a pillow cover, pouch, or maybe just one 'special' block to add to a quilt. What a great pouch! I love the Baby Jane collection - it would make a great bag and I'd learn to EPP, something I've not made time for before. I'm a new follower. Enjoy your weekend! I started doing hexagons on a train trip last month. I was using up scraps and bits, just to learn how. I still haven't put them together or on anything, but I really like the process. I'm excited to try it a little more deliberately - with particular fabrics and an actual project in mind. Using a mini-charm pack is a great idea! Oh yes, EPP is really fun. I just started making some hexi's. I plan on putting mine on a pillow. I really love the prints you chose for the pouch, so cute! I am keen to jump on the EPP bandwagon so would love to win this giveaway :) I'm on a cushion/pillow bender so I would have to use it to make a cushion for the sofa. Thanks for the giveaway! What a great idea! 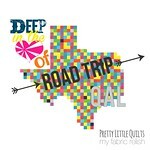 I love EPP for car trips. I have two panels I've made, but haven't turned them in to anything yet! Maybe pouches for me as well. I love your little pouch! And, like Heather, I enjoy EPP on car trips and even when we are out on the boat! I'm currently working on a hexie table runner for Christmas. Whoop whoop for your finish!! I love the tiny hexies and would make a fun pillow for our new camp. I have been EPP with 60 degree diamonds and would love to try hexies! Adorable pouch, Melissa. EPP is quite addicting! Thanks for the giveaway! your pouch is lovely! I've dabbled in EPP a bit, and it is truly addicting, isn't it? I will have to try punching holes in my papers like you suggest, it does seem that it will make removing them easier. Thank you for sharing the link to the template! you are very generous to offer such a nice giveaway! I would either use the hexies to embellish a baby quilt or to make a pillow :) have a lovely weekend! Hexies are definitely addicting!! I use Sewline glue pen to lightly glue baste my papers to my fabric. The papers pop right out and then I use them again. I am thinking wall hanging for my living room! Thanks for sharing and your bag is awesome. Love your EPP project. I've done some on a quilt top, but I've never made a pouch. I'm thinking that would be my project and would also give me a place to store my hexes while working on them. Thanks for the chance to win. I love the look of hexies. However I have been scared to try them. 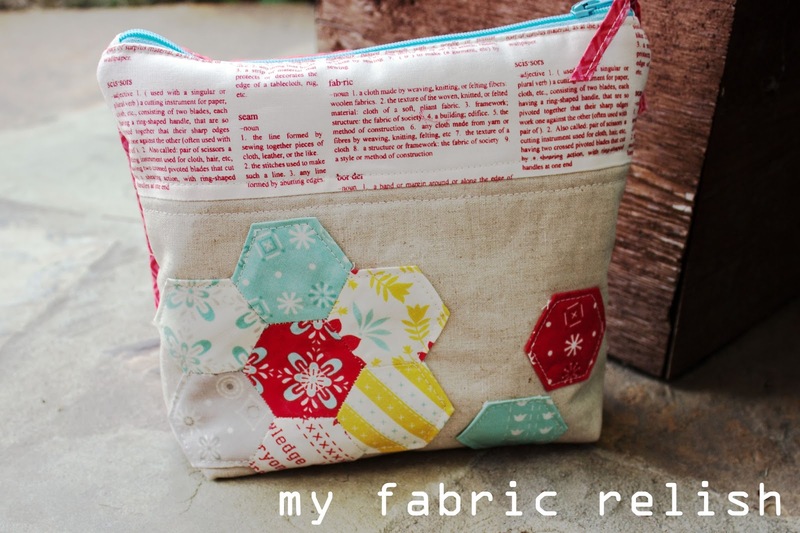 I fell in love with a little pillow made with hexies while shop hopping with some girlfriends last month. I really must conquer that fear! I really like your pouch, so I'd try that out definitely. This would be my first hexy project! I'm already a follower! 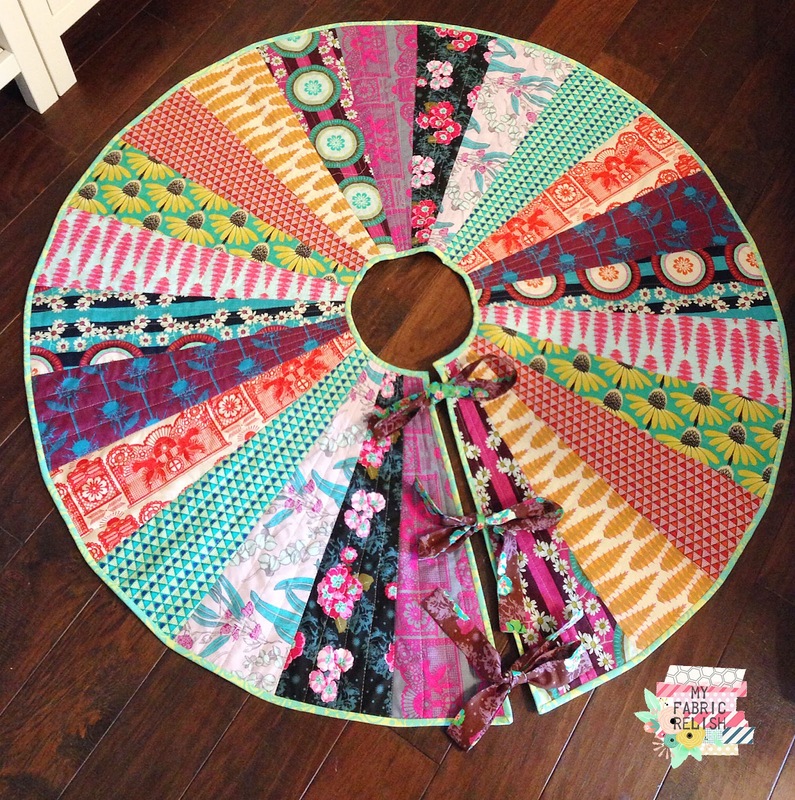 I haven't tried EPP, I'd love to win the supplies and the ooomph needed to get started. I would use them to make a table runner for summer. I haven't put anything on the table since Christmas and it seems so bare. What a cute cute design... looks totally fabulous! Love the pouch. I would use the hexies on a pillow. I am remodeling the kitchen and these hexies would be cute embellishments on pot holders, towels, curtains, etc. Colors are perfect! I would love to learn to EPP! 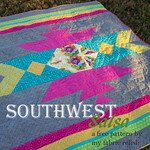 On my quilting bucket list! 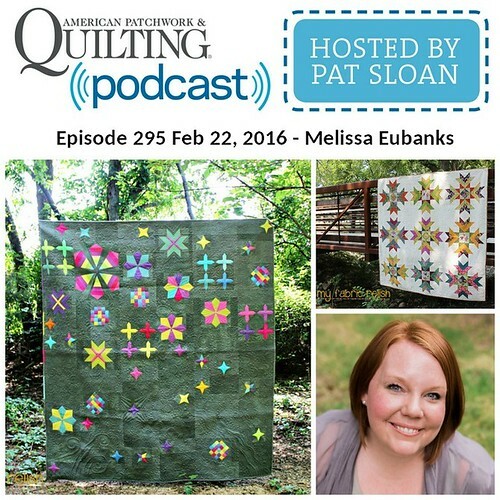 I have been wanting to try EPP but haven't made the leap yet! Thank you for the giveaway. I think I would use them in a quilt. 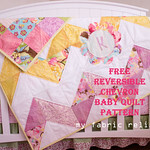 I am new to quilting so I don't know what I'd do with the hexies but they are super cute and I'd love to try EPP! Thanks! Thanks for joining us at Much Ado About Monday this week!